Our dogs need their very own space that will make them feel comfortable and secure at the same time. And we’re not just talking about a cozy sleeping spot. Although a dog bed works best when it comes to giving your furry friend a comfortable place to sleep in, you’ll need more than just that when you want to take him with you while traveling. This is where a dog crate comes in. With the help of the best dog crate, you’ll be able to give your dog a comfortable spot during transportation. However, it can also be used alongside other training tools such as dog training collars and invisible dog fences. Due to that, it’s important that you only get a high-quality dog crate which can serve your dog for years. While looking for the best small dog crate is easy, the task becomes a bit daunting when it comes to the big boys. After all, larger dogs will need an even bigger space so they won’t feel constricted while inside their crate. That said, we’re going to talk about the best dog crates for both small and large dogs on the market. But first, let’s talk about why using a dog crate can be beneficial for your dog. 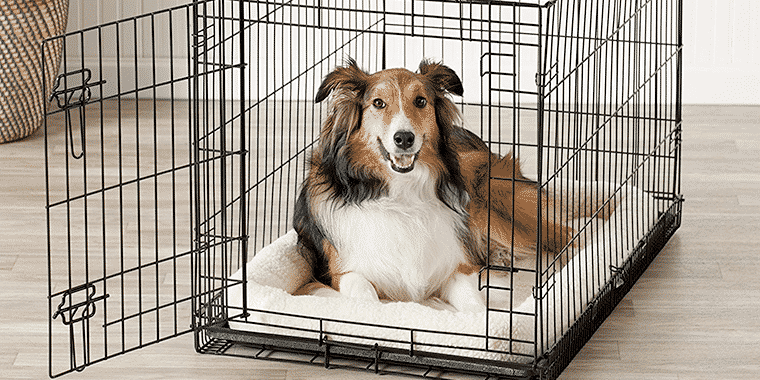 As your dog gets used to using his crate, it will serve as a comfortable place where he can retreat to when needed. However, for that to happen, you have to make sure you place it in a quiet area in your house. If your dog associates his crate as a comfortable room and bed, then he may seek it out whenever he feels tired, scared, or stressed. Since puppies naturally chew stuff, putting yours inside a crate could significantly reduce his risks of choking, electrocution, poisoning, or more while you’re out of your house. Moreover, tiny puppies have a high risk of being stepped on when there are many people inside the house. For this, putting your puppy inside the crate can be a really wise choice as far as his safety is concerned. However, you have to make sure that you don’t put him inside for too long. The time your puppy spends inside his crate should be limited. If you frequently travel with your dog, a dog crate can be really beneficial. After all, not all dogs feel comfortable traveling in vehicles, and a dog crate can help them stay calm and relaxed throughout the drive. It also provides them with a safe and comfortable way to travel. A plastic crate is designed to withstand lots of wear and tear. It’s basically a more private crate type with more solid walls. Due to this, plastic crates are generally more calming for dogs to sleep in. They’re also a legal requirement for transporting your dog via planes. Soft crates are ideal for dogs who are already comfortable sleeping inside a crate. They are similar to camping tents in terms of design and feature support poles and strong fabric for added durability and comfort. Basically, they offer your dog with a more comfortable sleeping place. As one of the most popular choices on the market, wire crates are made using thick metal wires. They’re generally very durable and easy to move at the same time. In fact, most wire crate models can be easily folded to make transportation easier and hassle-free. Wood crates are designed for those who are looking for a fancy-looking crate due to their furniture-like design. Also, the fact that they’re made of wood makes them quite durable. 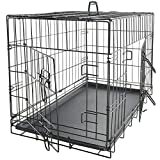 Another thing you have to consider when looking for a dog crate is your dog’s behavior and temperament. After all, different crate types have different levels of security and protection. For example, if your dog has an aggressive behavior, then you’ll need a crate that’s chew-proof and solid. Meanwhile, if you have a relaxed dog who won’t mind being inside a crate, then you’d do well with a softer one. That said, it’s important to choose a crate that will match your dog’s personality. This way, you can provide him with a comfortable spot where he can stay for a while. Upon choosing a dog crate, you have to check if its size can accommodate your dog. Fortunately, most manufacturers will provide size and even weight ranges of their products so you can determine if your dog can fit inside them or not. Additionally, you have to measure your dog in the process. The best thing to do this is to measure his length laying down as well as his height when sitting. Your chosen crate should also have enough room to allow your dog to switch positions whenever he wants. At the very least, go for a crate that provides around 1-2 inches of head clearance and around 4-6 inches of length clearance. If you’re planning to have your puppy undergo crate training, then it’d be wise to avoid putting him inside a plastic crate for long periods of time. This is because puppies tend to chew stuff a lot, and when they’re placed inside a crate, they will destroy it with if it’s made of a less durable material. For this reason, a metal crate would be a good choice for crate training purposes. A crate’s appearance would be the least of your worries. However, if you want to keep it inside your living room, then you’ll have to consider its appearance as well. You may want to go for a crate that can also double as movable furniture. For this purpose, wood crates would make the best option considering that they’re made with aesthetics in mind. The iCrate by MidWest Homes for Pets is no doubt one of the most popular choices on the market. It comes with a very simple yet durable and secure design as it’s made of thick and durable metal wires. However, that doesn’t compromise its comfort and safety as it has rounded corners. 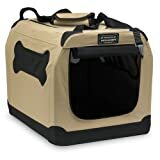 It also comes with a strong slide bolt system that will keep your furry friend secure inside. There’s even a divider for added comfort and a plastic pan to make cleanup a lot easier. Lastly, it’s easily foldable for hassle-free storage and transportation. If you need a small sleeping space for your little pup, then the Carlson metal dog crate is a great choice. According to the manufacturer, it is designed to be used by dogs weighing 25 pounds and below. Just like the iCrate, this one also comes with a slide bolt lock for added security and safety for your dog. It’s even lightweight, making it really hassle-free to carry when traveling with your dog. Lastly, it’s available at a really affordable price. Although PetMate’s crate is intended for puppies, it can still fit in smaller dog breeds without any problem. Its most notable feature is the top loading kennel which is ideal for keeping your pet secure and safe while traveling. With this top loading mechanism, you can access your pet with ease. Moreover, its ergonomic carry handle allows you to carry it comfortably as you travel with your furry companion. AmazonBasics’ entry is a versatile metal crate which can serve both security and training purposes. It comes with rounded doors for added safety, while the bottom side has mini dividers so your dog’s paws won’t get through. Moreover, it features two doors with secure sliding latches and a removable pan. 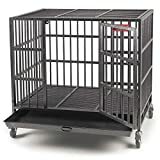 Do you prefer a metal crate for your dog? If so, this one is for you. In fact, it’s one of the best on the market, not to mention it’s really durable as well even among other metal crate brands. This is because the metal is treated to be waterproof so it can easily resist wear and tear brought on by full washing. That aside, it’s very easy to set up and store due to its foldable design. Its small size even allows you to use it for traveling purposes. 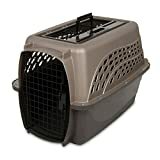 This soft dog crate from EliteField comes in a variety of colors to choose from. That aside, it’s the best soft dog crate when it comes to providing your dog with a lot of comfort. Since it has completely mesh sides, it won’t feel like a crate at all. Although it’s very easy to transport and is really lightweight, it’s not really that durable. If you prefer a more durable crate, you’re better off looking for another product instead. The Life Stages is, as the name implies, a reliable crate that will grow along with your puppy. It comes with a divider insert so you can easily customize it to fit your puppy as he grows. This only means that you can keep on using it until he reaches full-grown size. Moreover, as it’s made of heavy-duty gauge steel and comes in a mesh design, it is strong enough for your dog to chew through. Designed with an aesthetic purpose in mind, this wood crate from Crown Pet Products also doubles as an end table. Of course, it doesn’t compromise its safety and utility, hence allowing your dog to stay safe and secure while inside. The crate is made of durable rubberwood which is durable and can easily match your living room’s aesthetics. However, while it’s really durable, it’s not indestructible. As such, using this on an aggressive dog might shorten its life. With a heavy-duty mesh and steel frame, this indoor and outdoor crate is an excellent solution when it comes to durability and strength. Due to its design, you can easily take your furry friend along with you wherever you go. It even comes with honeycomb mesh windows to allow air flow, hence keeping your dog comfortable. It’s designed to be easy to set up and disassemble as well. No doubt one of the sturdiest crates on the market, the ProSelect Empire is a heavy-duty kennel that is capable of holding even the most aggressive dogs. Every part of this crate has been through heavy-duty wielding to ensure maximum durability. Another notable feature is its robust latches that will keep your puppy from getting into contact. This also deters any escape artist’s plan of escaping. 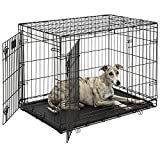 Regardless of the type of dog crate you choose, it’s really important that you only buy a high-quality product from among the best dog crates on the market. This way, you’ll be able to provide your pet with a safe, comfortable, and secure sleeping spot. Also, doing so will make crate training a lot easier and more effective.